The Don't Quit poem was written many years ago. The author of this poem is unknown. Sadly, in recent years a number of people have come forward to claim ownership of this poem and some have even claimed to have written it themselves! 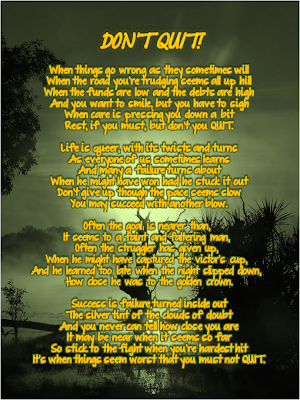 Irrespectively, this is certainly a great poem to remind us that our success is just right around the corner if we have the will to persevere. either way you are right!